Back when I was a little tacker, at about the age of twelve, I discovered Dungeons and Dragons. For me, like many others of my generation, the game was to make a big impact on my life. It sucked up many, many hours, both with friends—sharing adventures in imaginary worlds—and alone—designing worlds and underworlds, painting figures and preparing for the next game. I was always the ‘Dungeon Master’, or game referee, which meant I did a lot of work to prepare the games we played and make the whole game experience as smooth and enjoyable for everyone as possible. In contrast, the players pretty much just had to show up with their characters on a piece of paper (a ‘character sheet’ that I’d lovingly designed) and play. As D&D became more popular in the early-80s it started to cop some flack from hysterical fringe groups, due to a few isolated and unfortunate incidents involving obviously unhinged teens taking the game a bit too seriously. 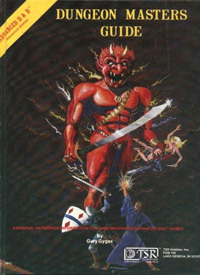 Right wing Christians, in particular, attacked the game for its inclusion of demons and devils, and accused it of being a ‘thin end of the wedge’ for Satanic groups. Sniffing a good story, the media latched onto these accusations and ran sensationalist stories about this strange new obsession that was gobbling up the minds of innocent teenagers. I remember in particular one story by the American Sixty Minutes show that was run here in Australia, that focused on a teen homicide supposedly inspired by D&D. In the story, the camera zoomed dramatically into artwork from the game books, focusing on monsters and demons and juxtaposing them with a lurid reconstruction of the crime. Enough to send any parent running terrified into their teen’s room to grab those D&D books and chuck them on the fire. 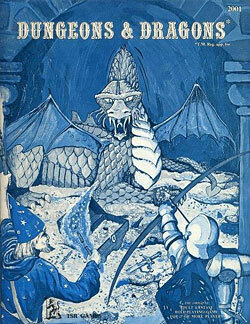 The story so incensed my early-teen self that I wrote the program a carefully composed letter berating them for their sensationism and extolling the virtues of playing D&D and similar games: what about the fact, I asked, that players were being creative, developing their imaginations, learning skills (I still credit those early days with my later interest in graphic design, at which I now I make a living), socialising etc. Why were the actions of a couple of crazy people overshadowing the millions of happy, well-adjusted gamers? Well, more than twenty-five years have passed and, surprise surprise, millions of teens didn’t grow up to be Satan-worshipping nutjobs. In fact, they mostly grew up to be highly intelligent and often unusually creative adults, and some of them, along with whole new generations, still play role-playing games. Of course, the fringe loonies still rail against the dangers of D&D. Here’s a quote from one of their websites: “Literally millions of young people are unknowingly participating in genuine occult practices and opening the doors for demons to enter their bodies through this seemingly innocent game.” Uh huh … riiiiight. So what reminded me of this kind of intolerance? The upcoming game BattleLore by Days of Wonder has a terrain piece called a ‘Magic Pentacle’ that features a pentacle symbol. To my amazement, some people on public forums have expressed concern that the use of such a symbol will offend some Christian sensibilities and possibly lead to some sort of ‘backlash’ for the company; or that it was a bad marketing decision to include such a symbol. Leaving aside for the moment that the pentacle is a symbol that goes back to ancient times and was only co-opted by occult groups in the last century; or that Days of Wonder publishes in several countries, not just America, where the vast majority of this kind of criticism comes. Instead I just have to shake my head in slack-jawed amazement at the kind of people who go through life with beliefs so intolerant, with world-views so narrow, with ignorance so complete, as to be offended or angered by the use of a pentacle symbol in a fantasy boardgame. Save us from the small- and narrow-minded, those who strive to restrict the boundless possibilities of the imagination to the claustrophobic confines of the religious fanatic. Tonight my girl and I sat down and watched The Lord of the Rings: The Fellowship of the Ring again together. I still had to hold back tears. Imagine if Tolkien had been forced to take out the balrog because it was too much like a demon, or Sauron himself because he offended right-wing conservative Christians with his similarities to the Devil. Let’s get rid of those witches in Grimm’s Fairy Tales shall we? Look, while we’re at it, Edgar Allan Poe wrote some occult stories … imagine how grey the world would be if we were not allowed to play imaginative games, or read stories or see films, until they’d been approved by some self-appointed, self-righteous body who had decided they had the right to determine what was a threat to our morality? There are always those who want to stifle creativity, sanitise stories, censor art. What a terrible shame their imaginations have dried up from disuse. Anyway, all that aside … repeat after me people: it’s just a game.